They lived on earth about 1.750 million years ago, in the Sothern part of Africa, Southern Asia, and other warm places because they had no way of keeping warm. Homo Habilis was not introduced to fire, clothing or very advanced shelters, unlike Homo Erectus. The group that came after Homo Habilis. 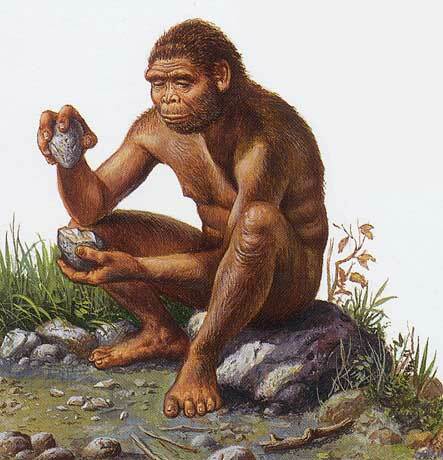 This is a picture of a man from the group of Homo-Habilis making tools for his tribe. Homo Habilis looks very different from modern day humans. They have a more rounded skull and their face is smaller, longer and more narrow than Homo Erectus'and modern day humans. Their jawline is curved with sloping sides, and their brain is measured to about 40-49 inches spuared, smaller than Homo Erectus who's brain is about 54 to 67 inches squared. This is only slightly larger than the Australopithecus' brain. They are about 4.5 feet tall, even thought their legs and feet are both adapted to walking upright. Homo Habilis did not wear any clothes what-so-ever. Much like Homo Erectus who also wore no clothing. Another similarity, neither of them were able to make speach or sounds of any sort because of the positioning of the larnyx. Both tribes hunted in groups, but with very basic tools, which had no specific use. They both also ate raw meats, berries, and nuts. Neither had any recreational or ceremonial traditions. Homo Habilis' shelters were nothing of use in this day and age, they were only a matter of sticks being held up by rocks around the outside edges. These were the first species of man to use their culture to adapt to their surrounding environments. They were also the first to hunt together in groups. Something Homo Erectus also did. Homo Habilis was also the first to make tools. These tools did not have any specific jobs, they were made for the general tasks needed to sustain life. Homo Hablilis was the first to make life sustainable. Even with the fact that they had no way of keeping warm.